Pichon, Helmet, Link and me standing outside a red barn-like butcher shop at the end of a dead end road in Chatham Township, NJ, on a chilly early autumn morning with a sixty-seven pound pig on a stick and four bags of charcoal, discussing constant rotation or focused heat with a man in a bloodied white jacket is the picture of this day. The first plan was to cook a proper ghetto pig. One day I happened across Link and Helmet talking about pig cooking methods and joined the conversation. They were discussing whether to bury it with coal and banana leaves, or to roast it rotisserie style. 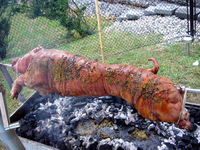 I told the story of when I first got involved in pig roasting through Cuz, and that the research he had done had turned up a website by a couple of Cubans in Miami who like to butterfly a whole pig, strap it to a chain link fence and grill it, something I had always wanted to try. At this point Cuz and I have rotisseried many pigs and have strong beliefs on the proper way to do it, but I have always thought it would be fun to do the ghetto pig version of the guys down in Miami. So Helmet, Link and I started discussing approaches and methods and decided the pig would be done lashed to fencing and set on cinderblocks over charcoal. About the time we figured out that un-galvanized aluminum fencing is almost impossible to get in the metropolitan New York area (I assume the weather changes of the northeast make it impractical to use unprotected steel, or aluminum) Helmet found this butcher in NJ that rents fire pits and rotisseries and gives you the entire pig already lashed to the spit. The story as we believed it was that this place was a working farm and we would be involved in the killing of the pig, something I felt obliged to participate in because of the amount of trepidation it caused me. As it turned out, after having steeled myself to face the discomfort of taking part in an intimate task of involving myself in the moment of death of my food that society has so removed us from it seems foreign, I had actually taken an extra step away from being involved because the second most intimate thing about roasting a whole pig is the actual hands-on step of securing the beast to the spit and the folks of Green Village Packing, had already done this for us. So we gave up a little involvement in the interest of convenience, which tears me. I hate convenience in food prep as a general principal. Wife and I long ago threw out our microwave believing that the little extra time taken in making things like mashed potatoes from scratch makes a far bigger difference in flavor. However, when preparing food for fifty folks, a little help is great. When Cuz and I roast a pig we have come to a pretty stripped down method. We simply and liberally salt the inside of the carcass and fasten it on the rod. We then salt it again on the outside, and set it over the heat. Now, to be honest, leaving well enough alone is the hardest part from here on out. In order to give ourselves something to do, we’ve picked up the little nervous device of dipping long branches of rosemary in olive oil and smacking them against the skin of the pig while it cooks. I know that the skin of a pig is tough enough to make footballs from so I don’t believe we are doing any flavor adding with our little exercise, but it is still fun and dissipates the energy of hours of staring. What the folks at Green Village Packing do besides giving you the fire pit, the charcoal, the rotisserie, and the spit, as well as affixing the pig, is to season its interior. They use a blend of garlic, herbs, adobo, black pepper and oil, all good and all sensible and all much appreciated. I clearly am a purist and find the flavor of slow-roasted pork best unadorned while cooking. I do like accoutrements like mojo, or vinegary slaw, or even hot barbeque sauce when it is done, but for cooking I keep it simple. That being said, nothing could be simpler than this. Literally all you have to do is go home, light a fire, set the spit in the rotisserie and cook until the ham and shoulder achieve 165 degrees in the center. And that’s almost what we did. My belief is the pig should be belly side down over low heat for about 45% of the estimated cooking time (about an hour for every 10-12 pounds). Then 20% on each side, 10% with the back facing down, and the remaining 5% spent spinning over much higher heat to crisp and brown the skin. The logic here is that the concentration of the meat is on the pig’s underside, so time spent spinning it leaves ¾ of each minute with the densest concentration of the meat being off the flame, making the leaner meat toward the pigs back overcook. So without a calculator I guessed our sixty-seven pound pig would spend two and a half hours stomach down, an hour or so on its left side followed by another hour or so on its right, half an hour with its feet in the air, and the remaining time spinning with periodic temperature checks. The reality is, as will always happen when men gather around a fire with raw meat, a committee formed with votes on how best to do it. Ultimately, we went with one hour belly down, one hour spinning, half an hour on each side (while a rosemary, garlic olive oil wet rub was applied to the off-fire side) and then spinning till it was finished (people like to watch things spin). There is also the truth that meat + fire = happy eaters. 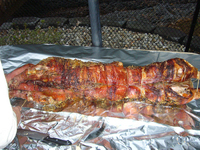 About 90% of the pig was consumed within half an hour of it coming off the spit. I was proud to have been a part of it’s making (even though the back was a little tougher then I like ;-) and, as often happens when I cook, I had little interest in eating it beyond the taste that confirmed I was proud of the job we had done. Instead, I went inside to eat the sofritto that Nettasdad had made of our pig’s heart and liver. Now that’s the way food should taste; once I figure out how to make it I’ll tell ya. I've noticed that you tend to hit different vendors in the greenmarket for different items, this one for tomatoes that one for meat etc… Besides the obvious that the guys with meat usually don't sell vegetables how do you know which farmer has the best tomatoes or mushrooms vs. the 5 or 10 others who sell similar items or which butcher to buy your steak or bacon from? I don’t play favorites. I believe the tendency toward routine breeds apathy. Just like with restaurants, I do my best to immediately try the new guy, compare him to the existing guys, and categorize him compared to the competition. In my experience, people settle once they are established so sometimes the new guy has a welcome refreshing, enthusiastic approach, and sometimes he just gets it wrong, meaning sometimes the old standbys rest easy and sometimes they are rocked and left behind. 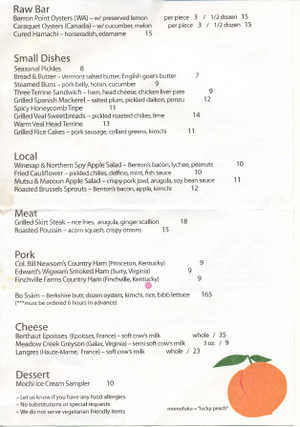 There are some guys with obvious specialties – Tim Stark for tomatoes, Keith Stewart for garlic, and so on. But I have a theory that since the chefs of NYC use these guys the best stuff goes to them, and we may find better by turning our back on fame. That being said, when I planned an heirloom tomato salad for the first course at my wedding I introduced a Jersey caterer to Tim so I would know I had the best (or very close to it) on the table, and no fall goes by without Keith’s garlic in our house. So where does that leave us? We are left milling about the market touching produce; make a habit of touching produce and you will know all you need to know about who has the best what. The best indicator of freshness and ripeness for most all fruits and vegetables is water. Water will tell you all. Pick up the worst tomato at the Greenmarket and the best at Whole Foods, and for the same size the one at the market will be far heavier. Heavier because picked ripe it is juicier, and shorter travel means less time for that moisture to evaporate. Sure, tomatoes (my whole reason for supporting a Greenmarket system in general, if there is a bigger disparity in the food world than that between the glory of farm stand/home grown tomatoes and the patheticness of every other version (be it organic or not) I have not come across it my general searching) are an easy one to pick. If the fruit is heavy, the skin is tight, the flesh is resilient when you press it with the pad of your thumb, and if the stem pulls or twists away pretty easily, you have a good candidate for purchasing. So now just walk around, see who has the best price and meets these requirements. For other fruit I will simply say traditional farming breeds much more unique-looking specimens than the industrial monoculture people for some reason call conventional today. I find it reassuring to embrace odd-shaped fruit – the tomato that looks like it grew around a rock or the apple that looks like 1/8 of it was not exposed to the sun and as a result is shorter. When I find parts where animals have been at them I like to take a glass half full approach: cut the parts out, and be thankful that something else found my food appealing enough to eat. For lettuces, corn, herbs and the like, look at the cut end. Is it moist? If so, it has recently been cut (soon after cutting the moisture will retract into the heart of the vegetable, and no spraying with water will fake this). Then break it. Great produce is so full of moisture even lettuce leaves will snap at the rib rather than bend. Don’t be afraid to tear a leaf from a head of lettuce and taste it, if they don’t have some out for tasting. Just do it because you want to buy, not eat. Nothing is sillier than habits like peeling back the husk on corn. Unless you hit the exact quadrant that happens to have a worm, you won’t have learned that, so now all you’ve done is make sure there is corn inside, and since the habit for shopping means you must observe at least two ears, the farmer is left with one that has been passed on by someone who knows so little about quality that they thought they could learn something in this manner in the first place. As far as Union Square goes, there is also the benefit of competition/knowledge of consumer to help cover your bases. Some serious chefs, as well as some people that seriously care about land stewardship, shop at that market, so if a stand isn’t good, it won’t last there. But get there early, for some reason these attentive choosers are also early risers. So now that we know what to look for and that even if we miss the best possible offering we are pretty safe, what else can we do? Talk to the farmers, talk to each egg person, I once bought a dozen eggs because a little girl helping her parents told me the names of the chickens that laid them. I am sure it was just fun and tales being told, but I like to encourage closeness, with my farmers and by a strange urban extension my food. I can’t stress price enough. Being at a farmers market is not a license to steal. Food should be fairly priced, and when asked any small farmer will give you a story that in the long run has him about ten thousand dollars a year in the red once he pays his organic dues. Look around the market, see what people are charging for ramps, and buy from the guy with cheaper ones. But know Organic certification does cost more, and promises more at this point. Which of the neighborhood wine shops do you recommend? I like astor for the huge selection and great prices for everyday bottles but cant pass up stopping in Union Square Wines for those new tasting machines on my way home from work. Wine is fun; I often wander into wine stores, ask a guy to recommend some juice, get him to tell me all he can about it, take it home and drink it. It is great if I love it. If I don’t, I must consider if it is what he said it would be, and if it is I am still positive on the shop and will just steer things better to my preference next time I’m in. In this way, I find I get the most exposure to what’s going on in the wine world. Once I have taken someone’s suggestion and decided if they are operating at a good level of information (the web and Oxford Guide to Wine are good tools), taste, and unique approach (a test both Astor and USQ pass), I look at price. In today’s age this is as easy as putting the name and vintage into winezap.com or winesearcher.com and seeing how they stack up (Union Square only beats Sokolin and Park Ave in this game, their prices are pretty lousy, cool kegerator or not). I am quickly becoming a fan of Bottlerocket, west of Fifth Avenue on 19th Street. They have a unique approach, an intimate feel, a good selection, they seem to see the value in developing regulars, and are always in the fair range when I double-check them on price, plus who doesn’t love a wine shop with a bottle of Ripple at the register? So I guess in most choices I am happy to pay up for quality, authenticity and uniqueness, but only to a fair price, and the way to know where this is to be found is to spend your afternoons meeting purveyors and sampling their wares. Often when I do it leaves me with a very good feeling of appreciation for my neighborhood, and that is always nice. I hope you find this helpful, never forget Lucy’s Greenmarket Report, an effort all of us in the vicinity of The USQ Green Market should be grateful for. Although spontaneous day drinking can be a very free-form thing, planned day drinking is at its best when there is a theme. I got a message from Bubby Friday that basically said it had been a while since we blew a day just drinking and he felt it might be in order this weekend. With this in mind, when I awoke yesterday and looked out at the weary gray day, it just seemed to fit that we go looking for Black Velvets. 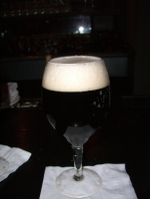 Black Velvet is a drink comprised roughly of 50% stout and 50% sparkling wine. That’s really all there is to it. 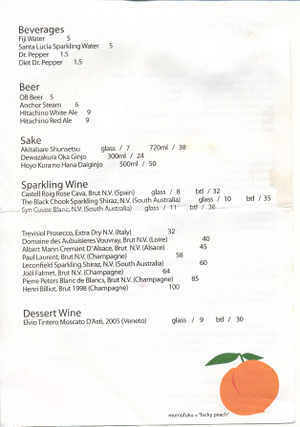 Some will say champagne is the right ingredient while others will insist that cava or some other bubbly will do. Seldom are these people addressing the way the different aspects will affect the drink, no one is saying the sweetness of prosecco will play better against the bitter stout, rather they are implying that cheap is better or, even more to the point, that champagne is too good for mixing. 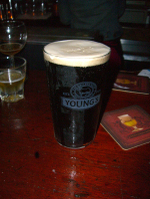 Be that as it may, Black Velvets in pubs should simply be whatever sparkling they have open mixed with whatever stout they keep on draft. At home, just grab whatever the cheapest bubbly you would drink alone is (for some that may be Kritter while with others it is Veuve) and mix it with your favorite stout. It truly is a glorious gray day, day drinking drink. 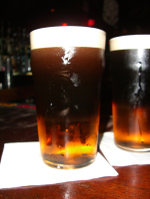 When pub-hopping it is important to know there is a version of the drink called a Poor Man’s Black Velvet that is cider and stout, which in New York establishments tends to be layered à la the Black and Tan. This is fine as long as you either enjoy the sweet cider or stop once you have drunk your way through the black. So off we went looking for some libations, we figured the East Village offered the most promise. First stop was Nevada Smiths on Third Avenue. The World Cup of soccer is coming up and Bubby wasn’t sure where to watch so Nevada Smith’s seemed a natural place to start. They are a British-influenced bar so it was a safe bet the would have the British drink, plus Bubby would get the lay of the land for soccer watching before he needed to get there by something like 7 am and pay a cover. 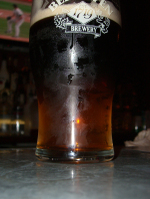 The Black Velvet here was a poor man’s layered into a pint glass, Guinness Stout on Magner’s cider. Not exactly the dry, crisp drink I had promised him, but at least a start and quite nice while watching a rerun of a famous England victory from the ‘70’s. The next place we passed that seemed it might have one was Jack Dempsey’s on Second Ave. 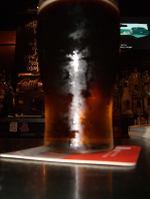 The bartender told us she would also be serving a poor man’s so I requested she use the Bare Knuckle Stout as opposed to Guinness with the Magner’s in the interest of variety. So there we sat, watching a subtitled version of The Matrix 2 (awesome that way, you read about one word every five minutes and it is usually “siren’s blaring”) seeing if we could tell a difference; we felt this version more smoky. One & One became our next stop, again a poor man’s Guinness and Magner’s, this time with Elvis’ music and a rousing discussion with the locals on whether the Egyptians had made beer before the vitis vinifera grapes were turned into wine. Next stop d.b.a., where the bartender asked “cider?” and Bubby, sick of hearing me complain about the sweetness of the poor man’s version said “actually champagne.” So this one was made with Compte de Gasconne and O’Hara’s stout. Lovely, huge and expensive, because it was served in a pint the bartender saw fit to charge fourteen bucks a piece, it was most of a bottle of bubbles after all. The irony in this cider-less version is its taste of apples. Properly made, a Black Velvet is reminiscent of apples, good stout has roasted red apple notes, and bubblies tend to range from green apples off a steel knife to Macintosh skins, depending on constituent grapes and time on yeast. Four down, we decided to go eat and imbibe our last while we waited for a table. So there we sat at the bar at Blue Smoke with a perfect Black Velvet each. In a white wine glass it was 50-50 cheap champagne and good stout. With the sun set, we had finally found the perfect British gray day cocktail at the only place that made sense in this crazy mixed up town: a BBQ restaurant.